The son of Mark Manning has spoken out about his father after the conclusion of the trial looking into his death. Mark Manning was last seen alive in April 2014. A business associate of his, Colin Gale, admitted to killing him and was convicted of manslaughter on Monday. Mark’s brother and sister Russell and Anna said: “No words can convey the pain and horror endured physically and mentally by us and Mark’s children during the past 32 months. “Mark’s loss is also felt around the world, where he diligently, professionally and with a cheerfulness cleared unmarked minefields and provided humanitarian aid, at times within active war zones. “Mark’s father died with a broken heart, not knowing of his son’s demise. We buried our father 12 weeks before Mark was found. They now lay together. May they rest in peace. “We would like say thank you to all of the police investigative team involved with seeking justice for Mark. At times this must have been very harrowing. Their professionalism and determination has always been respected by us. The Family Liaison Officers have shown professionalism that at times must also have been hard. Detective chief inspector Mike Ashcroft, who led the investigation for Surrey and Sussex Major Crime Team, said: “This has been a long and complex investigation and my thoughts and condolences remain with Mark’s family and friends who have waited a long time for answers and for closure. “Colin Gale killed Mark in a violent attack and then together with Stewart Robertson dumped his body in a secluded spot. 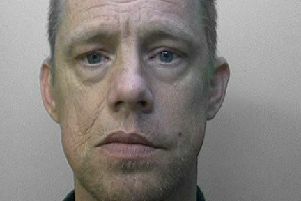 He then concocted a story about dropping Mark off at Worthing railway station and continued to lie to Mark’s family and the police.